Any patient who comes here is going to be depressed, and pessimistic about his chances of recovery. So we don't talk a great deal about the theory and principles of qigong. We first show him a video of group practice, where a large concourse is filled with hundreds of people generating powerful fields of life energy. We show him demonstrations where patients quickly lose weight or reduce their blood pressure or eliminate tumors. We show him patients' before and- after condition, the concrete results of practice. We don't show this to promote ourselves, but only to raise his confidence. In his mind, he is near death. When he sees there's hope, he practices qigong with determination. Some patients' illness responds quickly to practice, others' more gradually. One patient had lung and stomach cancer and he was a paraplegic. His doctors said he had one month to I live; they advised him to leave the hospital and not waste his family's money. He came here and stayed with us for 19 months, well beyond the time allotted him. Then he died. Our cancer patients, even though they die, don't suffer greatly. They don't need medicines and anesthetics. They're not emaciated or dispirited when they die. Some patients arrive as thin as a ghost. After practice, they put on weight. Some die almost a pleasant death while asleep. Others die while on the practice field; they take a break and die. Two died that way recently. One can say that they died with real human dignity. Do you find qigong practice has a better cure rate with certain kinds of cancer? We find little difference. Our practice is the same for all diseases. Other qigong methods may be more specialized in their applications and treatment. But among the many qigong hospitals in the country, ours may have the highest cure rate. I say 'may' because we don't have a comprehensive study done on this question yet. But if it is true, it is probably because our qigong method is not very complex or over-specialized. In any case, our success is reflected in our growth in the list few years. In 1988, we had 500 patients come for treatment. In 1989,900; in 1990,1700; and in 1991, we had 2800 patients. (Note: in 1999, there were 10,500 patients treated in the Center, which before closing in 2002 had treated more than 300,000 patients with a 95% overall effectiveness rate.) They come from all over the country. We don't promote ourselves advertise. They come after hearing of other patients' cures. Qigong is not well understood in China today. If you advertise, it's like you are selling something, and people get an unfavorable impression as a result. So we don't promote qigong, the hospital, or myself. We rely on patients' own testimony to get the word out. One time, a paraplegic was cured here. He returned home and the next month 20 paraplegics from his village came. Each term we have 20-80 paraplegics, some so bad they can't practice at all. They can't stand or walk, so we sit them near the practice field and gradually movement returns to their limbs. Soon, they are standing and practicing with the group. Their recovery rate is 40%, which is any patient who comes similar to the recovery rate of many other diseases we treat here. Qigong does not place the practitioner's attention on forms or rituals outside himself. It works with energy. How would you talk about qigong as a tool in man's quest to know himself? Qigong is a very profound system of knowledge. Qigong belongs to the highest ranks of Chinese culture and indeed, world culture. While India, Greece and Egypt did not use a terminology similar to qigong, all developed knowledge that belonged to the category of qigong. Chinese people talk about life energy as the source of the universe that causes the growth of all things. This is a much different creation theory than modern science. Astrophysicists talk about the Big Bang--an enormous explosion and the universe was created. But the Chinese talk about the primordial state of the universe in terms of life energy. Energy that creates and transforms. The ancients didn't talk about why this is so, but rather, how can one harmonize with this reality and conserve one's life energy. Man has this life energy. How is he going to use it? To cultivate life energy, one needs to replenish all the life energy that's been lost. How? Methods vary. Most rely on cultivating life energy in the body, aiming to make up the loss. China calls this the cultivation of jingqishen. Another method does not rely on the life energy in the body, but goes directly to the life energy of nature. This is our approach. We cultivate our own life energy through accessing nature's great store of life energy. This approach produces quicker results. But cultivating life energy is not the most fundamental; cultivating one's spirit is. Mastery of life energy is really achieved through mastery of consciousness. We use consciousness in a careful, craftsmanlike way, to shape our life, to attain our goals. If we use modern terminology to name this process, we call it qigong. The ancients used the word life energy and this mystifies people. But in modern terms, qigong is just the refinement of consciousness to enhance the state of energy in the body. This leads to vibrant health, a harmonious body and mind, and an awakened spiritual life. Practicing qigong is very easy. Using life energy to cure illness is also very easy. Our patients can learn to use life energy to cure illness in 22 days. After 3 months, 30-40% can use life energy to diagnose illness. Diagnosis may be through a visual examination of the patient, or by intuiting or feeling a person's disease. Up to 40% learn this skill fairly quickly. It's not that complex. Today, people have all kinds of notions about qigong. They think one uses qigong and cures an illness and that's it. Even if they cure themselves, many don't believe that deeply in the process. But qigong is not so limited. One can help others. One can help turn other people's lives around. Why can qigong cure illness? Qigong theory says that one's health is dependent on the body's normal life processes, which are all dependent on the unimpeded flow of life energy. An illness is a disturbance of this flow. Doctors would say functioning is impaired. Qigong doesn't focus on the cause of the disease, but rather on restoring the person to total physiological balance. If the life energy is unimpeded, body processes will normalize and the illness will naturally disappear. For example, people have unhealthy bacteria in their body but don't get sick. Why? Because their bodily functions and immune systems are strong. They resist the illness. But qigong does not rely on resisting diseases. It eliminates the source of the disease altogether, rather than leaving it latent in the body. In experiments, we see that a person's life energy can kill bacteria outside himself. Practicing qigong will certainly kill bacteria within. This is because traditional practices, while having great benefits, also have drawbacks. Some rely on silence, like sitting practice. To sit correctly, you must enter stillness. If you cannot or do so poorly, there will be a negative effect on the life energy. If you cannot enter into deep still states, you will not reap the rewards that come from stillness, like improved brain functioning, increased alpha waves, and decreased beta waves. In our practice, we don't over- emphasize stillness; we promote the natural processes in the body, creating greater flow, opening and balance. These restored natural rhythms produce vibrant health. Our qigong differs from other practices in that it changes the ancients' reliance on stillness. Instead, we emphasize movement as a basis of cultivation. The ancients always talk about attaining a state where “not a single thought arises.” Don't think this is easy. We say: just concentrate your consciousness, that's good enough. Focus on your feeling, awareness, consciousness, and spirit; eliminate the confused, fuzzy, weak, or negative. The result is you become a master of your own life, not a slave of the material world. Existentialists like Sartre say, “I want to be free. I demonstrate for freedom, that makes me free!” The freedom of qigong isn't like this. You must master the laws of life. After you master them, you're free. If you don't even know what they are, how can you find freedom? What rules of life are you talking about? The rules of life we hardly understand at all today. Modern medicine, biology, and anatomy only describe the activity of living phenomena. They don't talk about the basis of organic existence. Geneticists today are able to see DNA's molecular structure, but this brings them no closer to solving the questions of life. Why? When the DNA double helixes are alive, you can duplicate them. Why can't you do so when they die? There is no life. Reproduction is impossible. This means that DNA is just the material base for life, not life itself. The problem lies with reliance on inadequate scientific methods. The life sciences employ the same methods as modern physics. But modern physics explores the inanimate world. They discover the rules of inorganic matter. To use this method to investigate living organisms will not yield satisfactory answers regarding the nature of life. The focus of qigong is to investigate life and its laws. Unlike scientists, qigong practitioners use highly cultivated consciousness to understand life. The subtlety and sophistication of this consciousness far surpass any methods or technology employed by physicists or chemists. Life is beyond measurement and quantification. Our ordinary consciousness can reflect the world around us, but cannot understand it. Why? Because man places himself in a relationship of part to whole, even though his body and mind form a unity. laws of life, of living on this earth. What we understand today is not a macro-view of life, but merely an expression of life phenomena. There are various states of consciousness - one is sick or well, alert or sleep, active,passive, angry, happy, etc. Above these is a qigong state. Qigong focuses on the lower states, seeks to understand their laws and processes, and seeks to avoid their limitations. Through this understanding, it seeks to move to a higher state. But science inquires through measurement. What it sees in a certain state is no more than an observation. Science has no means to understand higher states. It has difficulty in understanding how to return the body and mind to balance and health. This is qigong's area of expertise. Qigong cultivation aims to move a practitioner from illness to health and ultimately spiritual attainment. We can see a process of development here. How does this compare to Buddhism and Taoism, which move from lower to higher stages? For the most part, religions don' talk about curing illness. They talk about transcendence, escaping the impurity of life. They talk of paradise. But qigong is interested only in living better on this earth. This is a fundamental difference. Taoists talk of becoming an immortal. Hinayana speaks of the 4 dhyanas and samadhis. Mahayana advocates “illuminate the mind and see one's self-nature.” It is not very easy. One must pass many stages, undergo many transformations before reaching this level. If you have a single thought or a single attachment, you can't attain it. An ordinary thought would obscure illumination? Any thought whatsoever would become an obstruction. Thoughts are distractions tied to the outside that force one into a relative relationship. One thought can stop you. One place where your mind is stuck will stop you. Illuminating the mind is relatively easily. Penetrating to one's self-nature (essence) is extremely difficult. Do you teach specific qigong practices for each illness or do all patients undergo a similar training? Everyone practices the same set of practices. The emphasis is on movement, not stillness. Do you include traditional Daoist concepts like dazhoutian, xiaozhoutian, dantian, meridians, etc.? It's not necessary. If you teach that, progress is slow. When the ancients cultivated, they reached very high levels. When they had those attainments, they did not need practices such as dazhoutian, xiaozhoutian, or dantian. They practiced “every point on the body is a dantian” - a state where man and nature become one. What we do here with our patient's aims at that level from the beginning. We use posture, movements, changes in consciousness and sounds, to amplify and maximize the connections between man and the environment. There are many zhoutian, heavenly circulation practices. The most traditional is to transform jing into life energy, which gathers and stores sexual vitality and circulates the jingqi in the dantian. When one achieves the lesser heavenly circulation, xiaozhoutian, it has the effect of lessening or eliminating sexual desire. How many people today could accept the elimination of their love life? The next practice is to transform life energy into shen, which creates the great shen and produces the “inner child” (yinger). Yinger is just a term for an entity created by consciousness and life energy. In this practice, you send the child outside yourself. When you bring it back, it returns with an external life energy, which you distribute to all points in your body. In this way, man merges with nature. This is an example of an early practice called dandaogong. Daoist practices are extremely numerous; this is just one. So you can see how complex it can get. Of the tens of millions studying qigong in China today, probably not more than a few have attained the first level, much less the heights of Taoist attainment. In our practice, we begin with the method of “man and heaven inter-penetrate.” Using life energy and consciousness, we cultivate the connection between inner and outer, we refine and store the life energy. We avoid the long, complex practice of zhoutian. What about the relationship of energies, jingqishen? We just talk about life energy, which includes jing and the body. Our body is actually just life energy. Physicists say mass is the materialization of energy; formless energy manifests as a form. There is truth to this. Traditionally, the universe was seen as a result of the transformation of primordial life energy. 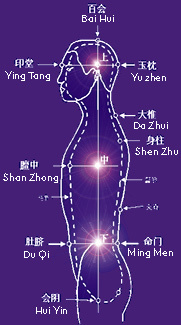 After this transformation life energy occupied what we can call the middle position, shen the upper, and form the lower. What we call form or the body is just jing. Every cell of our body is jing. The reproduction of a cell is jing. There are a number of different nuances involved here which makes this terminology difficult at first. The basis of this jing is life energy. Therefore, to understand life energy is to establish real root, real stability in your life. How did you develop your understanding of life energy? I practiced many different kinds of spiritual cultivation. Through the years I kept asking, what has value? What is useful? What really works? Gods and bodhisattvas? Mantras? Through this long period of searching and experimentation, I found life energy is the foundation of all. If you understand it, you will really achieve something in your spiritual life. But how do you cultivate life energy? You strengthen it with the body and refine it with consciousness. This was my discovery and conclusion after so many years. I'm a doctor. I practiced Western medicine for many years. Since 1962, I've practiced Chinese medicine and acupuncture. But even my Chinese medical study did not help me solve the profound problems of human existence. Fortunately, it provided many insights because it's also a system based on life energy. Insert a needle to treat inflammation and the swelling disappears. Where did it go? This is the function of life energy. So your teaching relies on absorbing and storing the life energy outside oneself and seeks to develop a powerful qichang, field of life energy, through group practice. Yes, we use the qichang in a special way. We have hundreds of people practicing together, building up a field. This has a tremendous power. During practice, we ask those who have tumors that can actually see or feel, to come forward so we can observe the results of their practice. After a group session, the tumors shrink or even disappear. This is something real, something valuable. It is the same with those with high blood pressure. After one practice, their pressure drops remarkably. In China, a lot of people practice qigong and experience uncontrolled laughing, crying, yelling, shaking, hearing voices, etc. This means they have no base. They falsely confuse these things for real progress. Some teachers will manipulate their students to have these psychological releases. But I think it's really shallow. We want to look at something real. A great many Chinese have tumors. If we can show qigong practice has a beneficial effect on reducing or eliminating tumors, then that's useful. It's a certifiable result. You can see it. It may be difficult for people to understand the power of a qichang. I think it's best not to introduce this practice in the beginning. The more you talk about qigong as miraculous, powerful, extraordinary, the more difficult it is for people to accept it. Even in China, I only introduce teaching that is close to people's real experience, something they can actually use. So I say, first talk about qigong as a cultivation to cure illness. People must learn to cure their own illness and not hope that a teacher will rub them or save them in some way. First establish your own health. A lot of people think, the more complicated a practice, the more profound it is. Actually, the more complicated a practice, the less effective it is. So if you learn how to harness and use this life energy of nature, to cure illnesses in yourself and others, you've really learned something fundamental. You have a stable base from which to go forward. This website is dedicated to disseminating the information and means to connect you with the being-science of Wisdom Healing™ Qigong.